Blister treatment for hikers is serious business. Your feet are your ticket onto the trail. If you're in pain from a hiking blister on your foot, you're not hiking. Or hiking in a sub-optimal hobble. Read this for blister prevention strategies, which is the smartest approach to guarding your trail time. Read on to discover treatment approaches once you've got a hiking blister, and learn whether or not to pop that painful bubble. Should I pop a blister or not? can become an all consuming question on a backpacking trip! So you've developed a blister on your toe from all that walking. Don't be the hiker who moans in pain and wishes for blister treatment supplies. Instead, be the hiker who whips out a well stocked blister treatment kit, including equipment to drain a blister and to apply an ointment in a hygiene manner. Your blister treatment supplies should be kept together in a water repellent, lightweight but durable bag. Flimsy plastic bags won't cut it, because you want these materials to stay clean and dry. A blister kit also requires lightweight scissors and tweezers, although these might already be in your simple first aid kit. If not, stash them in this kit. Also in your bag should be some sort of material to prevent further friction, along with something to deal with discomfort. Moleskin is a tried and true approach to blister treatment because it's easy to apply. Note that moleskin provides a way to cut down on the rubbing from your boots, so take the time to carefully craft your custom shaped moleskin. And to combine the magic of Glacier Gel with the physical barrier of moleskin, get this kit. It includes alcohol prep pads and antiseptic towelettes to ward off infection from trail dirt (stings like the dickens but cuts down on a chance of infection). These items should be in your kit, regardless of which approach you go with. There are pros and cons to popping a blister. If you're on a short hike, the blister is small, and the skin is intact, don't. If you're out for several more days, maybe you should. Once you commit to popping it, be sure you're clean about it in order to reduce risk of infection. Wash your hands, and the blistered area, before you begin. Hand sanitizer will sting! Have all of your supplies handy so you're not digging around in your kit. Put the blistered foot on a clean surface such as an unused hiking shirt. Use your rubbing alcohol, pre-moistened wipes, or soap and water, to clean the area. Make a small hole with your clean instrument. Allow fluids and pus to drain onto a clean tissue or paper towel. Dispose of this in a zipped plastic bag. Act quickly and methodically to decrease the amount of time the blister is exposed to the air. A thin coating of petroleum jelly will decrease the pain level from your minor surgery as well as the air currents. If your immune system is in question due to age, medical conditions, or prescription medications, consider applying a topical antibiotic along the edge of the blister and across its diameter. Trail dirt can have any number of microbes lurking within. Don't ignore signs of infection such as swelling, pain, red streaks leading away from the blister, pus or warm skin around the blistered area. Just so you know, the devilish triad of blister formation is heat - friction - moisture. Blisters develop from inattention and the wrong stuff on your feet. you know to jump on hot spots IMMEDIATELY by cooling down the area with snow or cold water. 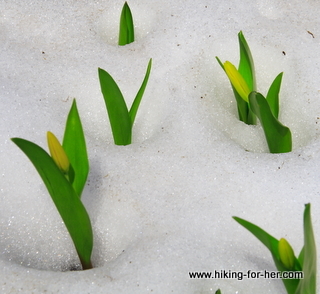 You'll be wishing you were these glacier lilies in the cold snow if you have blisters on your feet! ... don't ignore hot spots on your feet. Why treat a blister when you can prevent it? Stop immediately if you sense pressure, heat or discomfort anywhere on your feet. Reduce friction on your hot spots with sock adjustments. If your toes feel extremely hot, squashed or uncomfortable, try loosening your laces. Or consider a different boot lacing strategy. If you're wearing two pairs of socks, take one of them off to see if that helps. If your heel is developing a red, hot area, get moleskin or duct tape on it right away before it deepens. You do NOT want to hike back to the trail head in escalating pain, so take the time to do a good job preventing additional friction. Sometimes it's your trail buddies, urging you to keep going no matter what. 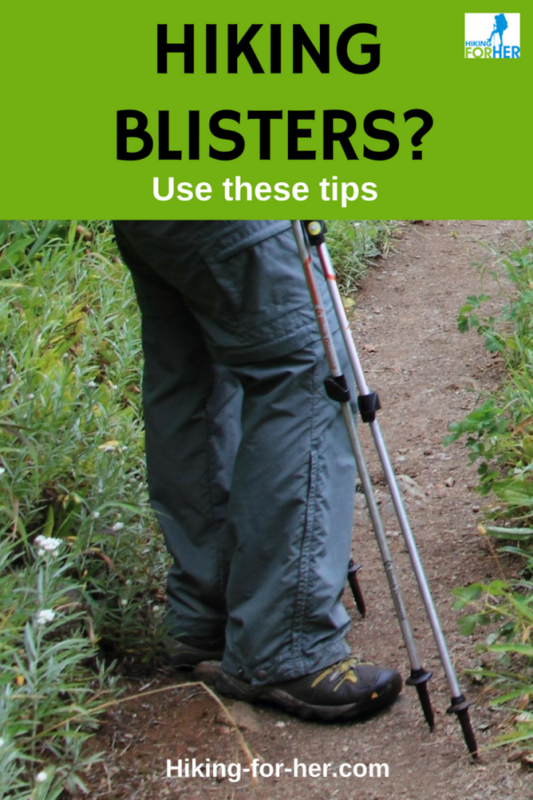 Your blisters will slow down everyone sooner or later if they are not dealt with pro-actively (and protectively). So step off the trail, get out your treatment kit, and take care of your precious feet. 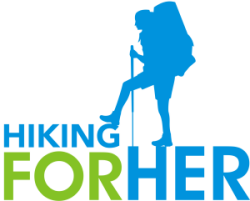 Tell 'em Hiking For Her said so! And use these hiking foot care tips to make sure your feet stay in top shape all season long.